Sergeant Laboratories announced today the expansion of its AristotleInsight::K12™ Borderless Classroom Technology to include their new Teacher Controlled Browsing. AristotleInsight::K12, their flagship educational tool, currently provides the industry’s most robust and cost effective platform that includes Classroom Management, Student Behavior Analytics, Distributive Filtering for CIPA regulations, Asset Tracking & Reporting, as well as Missing Device Location. AristotleInsight::K12 takes a teacher-focused approach to classroom management. Expanding on the philosophy of providing technology that is ‘as simple as a light switch’ to use, Teacher Focused Browsing allows educators to take control of their classroom without relying on support tickets and waiting games. Backed by over 20 years of in classroom research and development, the latest release of AristotleInsight::K12 introduces revolutionary new ways for educators to manage their classroom. 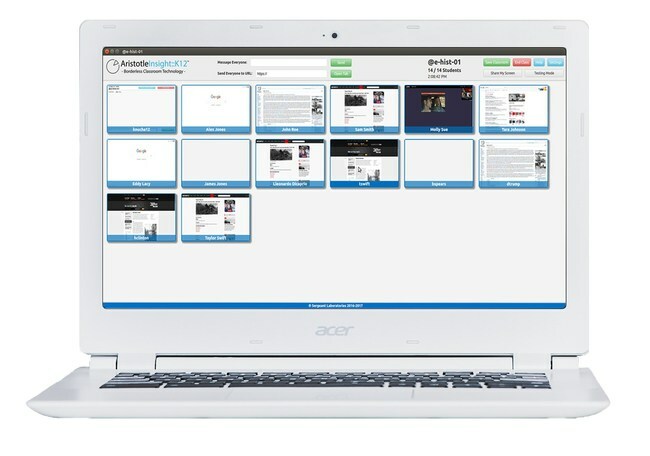 By combining Teacher Controlled Browsing with AristotleInsight::K12’s classroom management functionality, student behavior analytics, geo-location, forensic auditing, and utilization reporting capabilities, AristotleInsight::K12 becomes the sole solution needed for improving technology learning outcomes and teaching digital citizenship. AristotleInsight::K12 is engineered to meet the unique needs of modern school districts. Districts today have all types of devices, such as PCs, Chromebooks, Macs, and printers. AristotleInsight::K12 not only works seamlessly in the classroom environment, it also works outside of the school network to allow students to remain safe when taking 1:1 devices home with them. Existing AristotleInsight::K12 customers have access to all of the features discussed as well as many other product enhancements. You can learn more about the newest updates to AristotleInsight::K12’s Borderless Classroom Technology, and more about the benefits of Classroom Management, Distributive Content Filtering, Asset tracking & reporting, and Student Behavior Analysis reporting by visiting www.aristotlek12.com or calling 866-748-5227. AristotleInsight::K12 is an all-in-one solution for Classroom Management, Student-Centric Content Filtering, Asset Tracking & Reporting, and Student Behavior Analytics. The system provides student visibility, real-time alerts, and automated reporting on all device types, including Chromebooks, PCs, Macs, CloudReady, and Printers. Copyright © 2000 - 2019 Sergeant Laboratories. All Right Reserved.